Since antiquity Ceylon's Trincomalee has been renowned the finest harbor on the Indian Ocean. Plan of the Bay and Harbour of Trincomalay, on the Island of Ceylon. 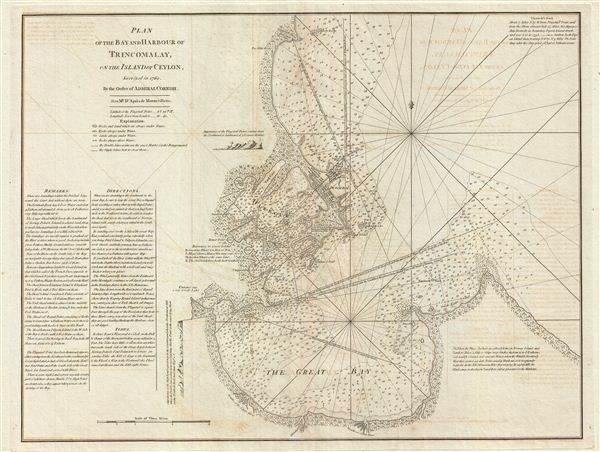 This is a fine example of Laurie and Whittle's 1794 nautical chart or maritime map of the Bay and Harbor of Trincomalee, Sri Lanka. Trincomalee is the largest and safest natural port in the Indian Ocean, accessible to all crafts in any weather condition. It has been renowned as a port since ancient times and was mentioned by both the Venetian merchant traveler Marco Polo and Alexandrian cartographer Claudius Ptolemy. By the end of the 18th century the port had changed hands several times and, as this map was being drawn, Trincomalee had been alternately under Dutch and French control over the previous fifty years. The British would capture it one year later, in 1795, and hold it until Sri Lankan Independence in 1948. Laurie and Whittle prepared this chart for their 1799 issue of the East-India Pilot. Cartographically this chart is derived from earlier maps prepared for Jean-Baptiste d'Apres de Mannevillette's 1745 Neptune Oriental. It was subsequently resurveyed, updated and revised at the command of Admiral Cornish in 1762. The map offers rich detail including countless depth soundings, notes on the sea floor, commentary on reefs, rhumb lines, shoals, place names and a wealth of other practical information for the mariner.